Mechanical GIFs Featured on Cool Tools Gift Guide! My MechanicalGIFs.com acrylic models were just featured at the top of the list on the CoolTools Holiday Kits gift list! Which is a bit of stress since I’m scheduled to leave for China early tomorrow morning. Orders were strong today, but we’d built up a good amount of stock already, and are scrambling tonight to make enough to last, hopefully, until I get back. They are right, of course, these kits are indeed the finest available stylized clear acrylic mechanical models. Chances are you need several, right? I Just Saw the Coolest Thing! I just saw the coolest thing ever: a Wall Printer! It's really nothing more than a 4-color inkjet printer on its side, pointed at a wall instead of a piece of paper. The head goes up and down, and because moving walls is hard, the beam holding the head moves slowly along the horizontal track set up to hold it. It's clearly modular so you can set up as much track as you like by joining sections. The drive motor for moving the beam is mounted in the self-contained vertical unit: it turns a gear engaged with a toothed belt that is stretched the whole length of the horizontal track. Loops of extra belt at the end indicate that this is not the maximum length. Really, there shouldn't be any practical upper limit to how long a wall you could paint with this thing. The resolution is not super high, but for a billboard-sized image, it's perfectly servicable. It did show some bleeding or over-spray in some places but not others. All in all I think it did a great job under difficult circumstances. It appears to run autonomously from a built-in battery (no cords), and the image is presumably on the memory stick you can see inserted on the front of the print head. So it should be possible to set it up anywhere in the middle of nothing and paint a wall. Imagine the possibilities for slow-motion urban graffiti! According to this TaoBao (Chinese eBay/Amazon-like market) link, this lovely, lovely device costs about $2700, which seems like a very reasonable price to me. Phew, I'm tired already! As for the location, well, hopefully if you're in China and want to go to these talks your Chinese is better than mine and you'll be able to navigate the site to figure it out. All I could get out of Google translate is "This uncle is really interesting." which I think is referring to me. A few years ago I thought I had hit the pinnacle of my career as a writer when a kid came up to me just before a book tour talk and showed me a picture of his cat, which he had named Theo after me. What could possibly top that? Well, I just found out! 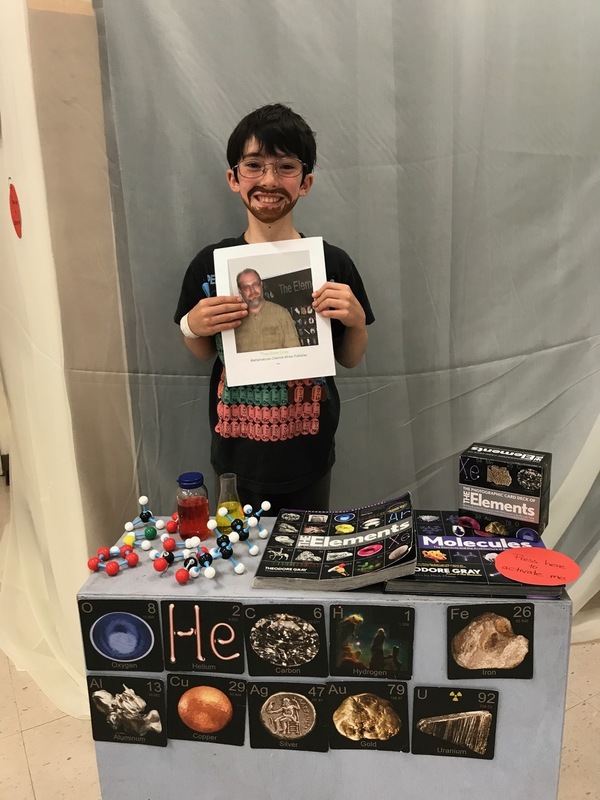 Behold, here is Liam, a third-grader, dressed up as me, complete with painted on beard! For a school project he was supposed top pick a favorite author, write a biography, and dress up as his chosen person. He chose me! How cool is that! Sadly two important details of his portrayal are now out of date: I don't have a beard anymore (new girlfriend) and I don't have any hair on top either (old age?). Thank you Liam for making my day. I was in China recently and met a reporter from China Daily (the main English-language newspaper covering China for a western audience). The result was this profile of me published today (2018-6-15) as their "Last Word" back page feature. I Made a New Engine! I'm was at the G4G conference last week and working on my (6-minute) talk caused me to think again about the motivation behind making steam engine models. Nearly all model steam engines (and some full-size ones) use a beautiful set of harmonic motions to create the self-sustaining, alternating application of steam pressure to first one side and then the other of a piston, which drives a flywheel, which in turn drives a valve that causes the alternating steam pressure. This model shows the fundamental fact that the two harmonic motions, that of the piston and that of the valve, are 90 degrees out of phase. When the piston comes to rest, the valve is moving fastest to switch the steam over to the other side. This is a beautifully simple mechanism, and it's the smoothest possible way of running an engine: everything is in harmonic motion, meaning the least possible change in acceleration at every point in the cycle. But it turns out there is a simple and commonly-used (on real steam engines and some models) way to achieve a sort of approximation to the cosine wave. And the curve you get is actually better than a cosine, in that it makes the valve move faster exactly when needed, and remain completely stationary when it doesn't need to move. The motion is not smooth, but it serves the engine better. 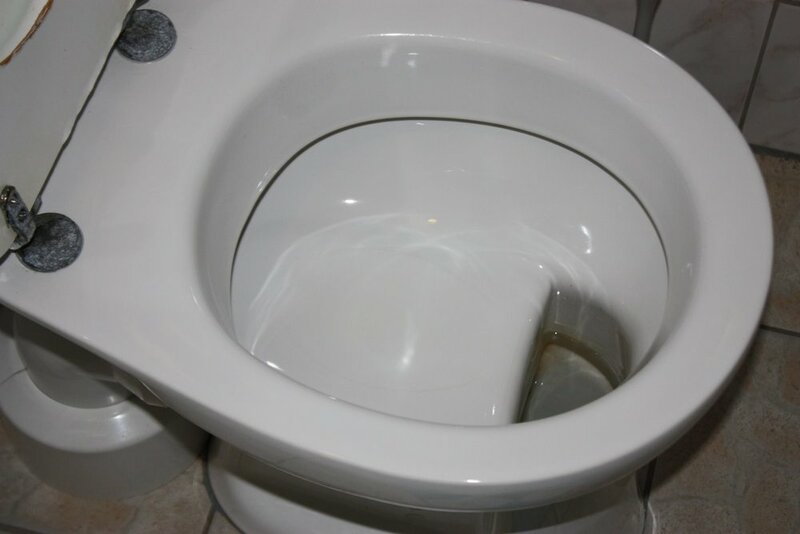 Notice that this design has only one takeoff, yet the motion of the valve is still maximized at the point where the piston comes to rest (actually just before). The trick is to use the very top/bottom of the sine wave, magnify it (with mechanical leverage), and then min/max it (with a sliding toggle) to create hysteresis. Mathematically, the motion of the toggle is approximately 5 * max(0, sin(x) - 0.8), with appropriate switching of the sign for the negative lobe of the sine wave. This plot shows the piston (green) and valve (orange) positions as a function of time through one complete cycle. If you add a cosine wave to the plot (actually -cos(x)), you can see how the jerky, toggle-based curve is a mechanical approximation of a cosine, but squared off. What you actually want from the point of view of steam flow, is a square wave: the valve should switch instantly from one side to the other, exactly at the extremes of motion of the piston. The whole elegance of having two pure harmonic motions is really not ideal at all from this point of view, which is why such mechanisms are not used on large engines. There is another "mathematical" way of looking at the difference between engines that have separate sine and cosine connections to the flywheel, vs. a single sine wave connection. The combination of a sine and cosine wave define a direction of time, as it were. With time (x-axis) moving forwards to the right, the sine wave leads the cosine wave. If you reverse time, the cosine leads the sine. Therefore, this engine can only run in one direction (unless you interchange where the steam is coming in with the exhaust). But a single sine wave does not change if you reverse time: it is symmetrical to time reversal, as they say in physics. That means, necessarily, that the single-connection engine above must be able to run in either direction without changing anything in the mechanism. Another way of looking at it is to say that the entire mechanism to the right of the flywheel has no way of knowing which direction the flywheel is turning. The harmonic, sine wave motion will be identical regardless of the direction of rotation, therefore it must work either way. So what determines which direction it actually goes? It's all down to which side the valve was flipped to when the engine is started up. The hysteresis of the valve creates the direction-of-time difference. That's actually a thing in real engines: I saw a model steam engine with this type of valve just a few days before making this design. The guy showed me how you flip a lever before starting the engine, and it was clear that this lever was not redirecting steam. At the time I didn't understand how this could work, which caused me to worry about it until I finished this model, and now it all makes sense. Literally hundreds of patents were issued over a span of centuries, focused on improved methods of controlling the timing of steam engine valves. For example, you might want to optimize for maximum work per unit of water used to create steam, instead of optimizing for maximum power from a given size of piston,. If so, you design the valves to admit a small amount of high-pressure steam at the start of the cycle, then close off quickly, allowing the steam to expand within the cylinder. The pressure drops off as the cylinder moves over, but you don't use any more steam. In practice this is said to get you about 2/3 of the work for 1/3 of the water, compared to applying full steam pressure for the whole stroke. Towards the end, before the steam engine was replaced completely by internal combustion and turbine engines, the valves were mostly "poppet" style valves, driven by cams. The timing could be changed at will to optimize for torque or efficiency. P.S. I love my laser cutter! As I said, I came up with this design while working on a talk. That was Monday evening, and my flight out to the conference was Wednesday early morning. Around 11PM that night I decided it was nuts to try to actually make the engine in time to take to the conference, so I started working on the CAD files. By around 1AM Tuesday morning I had a design ready (based on my Folded Steam Engine, lengthened a bit and with the valve connection replaced with the new design). Around 10AM Tuesday morning I went to the shop and laser cut the new design. It took four or five re-cuttings of the piston and toggle lever to fine-tune the dimensions so the valve moves the correct distance (taking into account the reality of the laser cut width and the slop in the screw pivot joint, which are a bit hard to predict in the drawing). Once the design was good, I made six copies, put a couple of them together, then Nick and I photographed a time lapse of the new design. All that took maybe 2-3 hours. 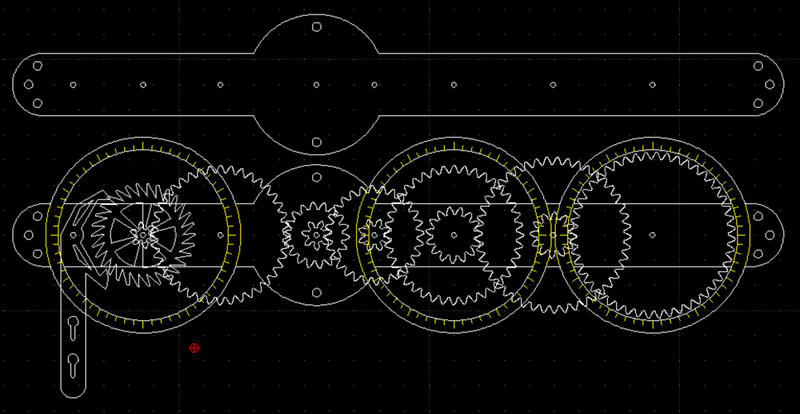 I really do not know of any tool that works so fast and so perfectly to churn out beautiful-looking mechanical parts. I really wish 3D printers could come anywhere near this level of speed, economy, and beauty of results. While waiting for that, I will continue to live in my 2D laser cutter world. 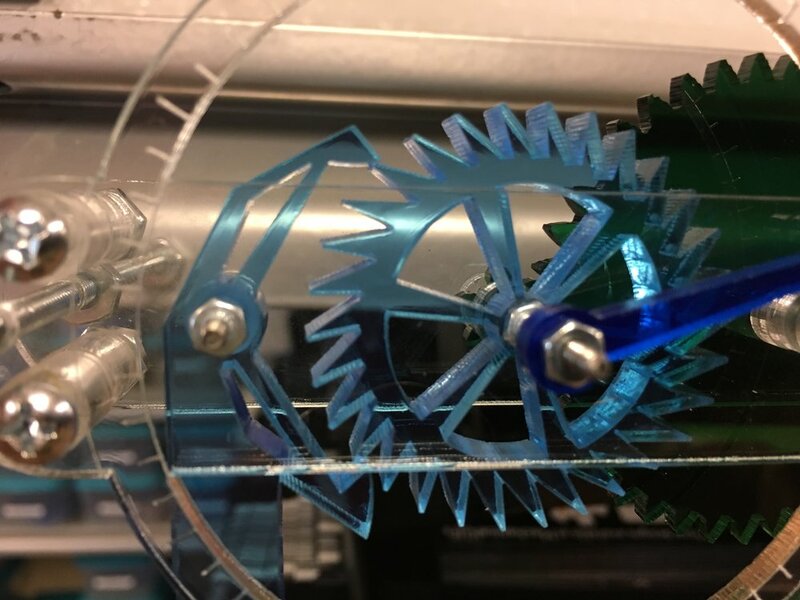 I've finally gotten around to my original intention of publishing the plans (layered DXF files) for all the laser-cut acrylic parts of all the models featured at mechanicalgifs.com. You can find them at my Thingiverse collection. I have no idea if anyone will actually try to make them from the plans. I'm pretty sure that, unless you already have all the different parts and types of acrylic on hand, it would be cheaper to buy my kit of the same thing. But on the other hand, it might be more fun to make your own parts? If you're the sort of person who would make this sort of thing from Thingiverse plans, I'd be interested in opinions. I promise that some day I will write about something other than making kits, but for now that's what I'm all about. Today I'm pleased as punch about my new semi-automatic small parts bagging tool, which I call the Bagger 2000 (because it holds and fills 20 bags at a time, and because 2000 is a hundred times better than 20 as a model number). The issue is this: we need to fill hundreds of 2" x 4" poly bags with lots of little nuts, bolts, and small plastic parts. Each bag gets a dozen or more different parts, and sometimes a dozen or more of one particular part. We had been doing this using a batch of 20 pill counters (small trays with a trough on the side, designed for counting out pills in a pharmacy). This works, but it is tedious, and the sides of the trays are very low, meaning there is a constant danger of a part getting knocked out before it's emptied into the bag. What I wanted was some kind of system where I could drop parts directly into the bags using a funnel, or something like that. But it would have to be 20 funnels, one for each bag in the batch, and I couldn't think of a good idea for how to hold the bag onto the end of the funnel, how to hold up the funnels, and so on. Until I realized that I own a laser cutter and have been practicing my inventing skills. Here is the result: the Bagger 2000! Being made entirely of clear acrylic, this object is actually quite difficult to decipher from a photo, so here's a short video that gives a better idea of its three-dimensional structure. There are 20 individual rectangular funnels: at the bottom of each, the acrylic sides have been bent around to form little upwards-pointing hooks. To use the device, you flip it upside down and load it with 20 poly bags. The acrylic clips grip the zip closure on the poly bags. Flip it back right-side-up and you have twenty bags hanging underneath 20 funnels. What's needed is a staging area where items can be laid out in plain sight, before being dropped down into the bag. My big breakthrough on this project was realizing that the semi-automatic parts counter (described in an earlier blog post) was perfect for this job. The funnel array has exactly the same dimensions and spacing as the parts dropper, so when the dropper is placed on top of the funnels, they line up perfectly. Here's a side view showing how the parts are guided down into the bag. Where the Bagger 2000 really shines is when it's combined with the parts counting feature of the parts dropper. Here the parts counter, positioned on top of the Bagger, is being loaded with 16 hex nuts for each bag. You just wipe a pile of nuts over the counting plate. Then, after double-checking that all the holes in the template are filled, you simply pull back the gate and presto-magic, all the nuts are dropped perfectly into their respective bags. 320 nuts (16 times 20) counted and put in bags in about a minute! This machine has at least doubled the speed of filling the average kit bag, and I think it will also contribute to a lower error rate. I'm just about ready to start wondering how other people solve similar problems. My approach to learning about a new area is often to try to do it myself first, without looking too closely at how other people do it. Then, when I feel like I have a really good handle on what the issues are and where the difficult problems are to be found (i.e. what have I not been able to figure out myself), then I'll do some research. Usually I find out that there are much better solutions, but I feel it's worth doing the messing-around phase first, because that's the only way I can properly appreciate how clever the better solutions are. I'm at the stage now of needing to make about a hundred copies of several of my mechanical gifs kits. There's a balance between spending time making the kits, and spending time making tools to make the making of kits faster. How much automation is right depends on the scale of operation. A couple days ago my photographer Nick suggested a simple device to semi-automate one of the problem steps: counting out a dozen or so small items. (For example, twelve #6 hex nuts for each Combination Lock kit, or 42 nuts for the nightmare Transaxle kit.) After some prototypes and design improvements, I've ended up with a device that lets me count and place twenty copies of a given number of items, quite efficiently, and with hopefully a very low error rate. The first step is setting up 20 pill counting trays and adding the small parts (nuts, bolts, etc, anything that will fit in a 2" x 4" plastic bag). They are always laid out in a 4 x 5 grid, for consistency. The parts counter is also arranged in a 4x5 grid, so it not only counts each individual group of parts, it also confirms that all 20 trays have gotten their dose of parts. A custom template slid in the top determines how many of what shape of object will be counted out. Here it's seen loaded with six springs in each of the 20 positions, for the Pin-Tumbler Lock kit. Below we see it in action counting out seven #2 nuts, also for the Pin-Tumbler Lock kit. This is literally Koatie's first time using the new device: we both got much faster at it after a few passes! Nuts are particularly well-suited for this kind of device, because they fall automatically into the holes in the template. We can fill it just by wiping a bunch of nuts over the top and then pouring off the excess. But the template seems to work well even for things that have to be placed one-by-one into the slots. For example, these pins for the Pin-Tumbler Lock don't fall into place, but it still faster and more reliable to manually place them into the slots, and then dump them out automatically. Well, I hope you're not bored with my endless details about manufacturing. It's a learning process, that's for sure.